Why an Instant Eggnog Mix? I realize the holidays have been over for quite some time, but I find myself with a strong desire for some eggnog. The only problem is I can only find eggnog around the holidays. I could buy all the ingredients, drag out my blender and make a batch, but then I would have leftovers, more than I would consume in the allotted time. That’s when I came up with an idea. 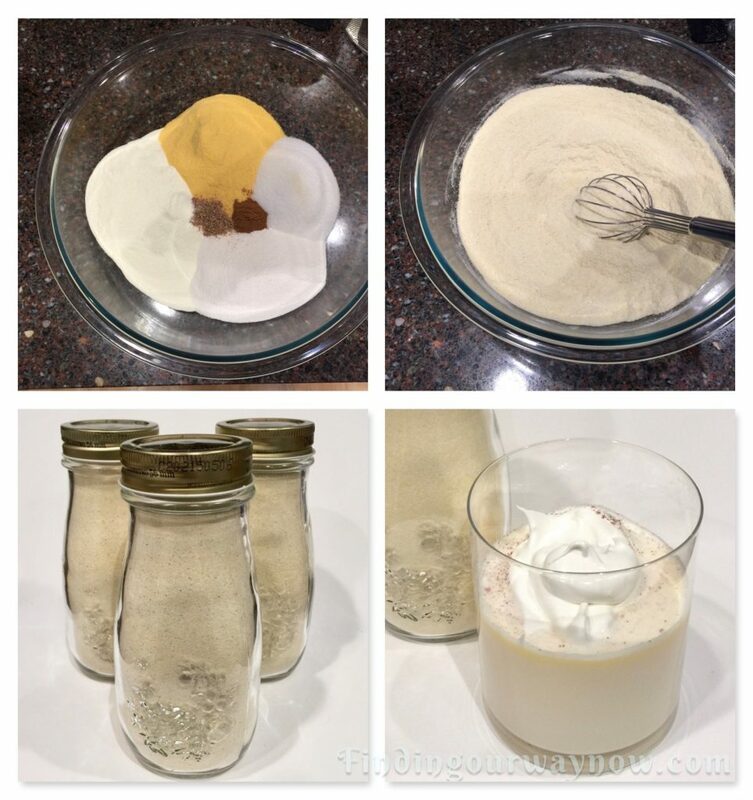 Why not create an instant eggnog mix. It took some doing, but I do like the result. It’s pretty yummy if I don’t say so myself. Measure and pour all the ingredients into a large mixing bowl. Whisk the ingredients until thoroughly blended. Using a canning funnel, pour the mixture into five 1-pint milk bottles or jars and label with instructions. You can give the jars away as gifts or store them in your pantry. The mix will last up to 6 months. Instructions Label: To serve, add ⅓ of a cup of the mix with 8 oz. of ice cold water in a pint jar with a tight lid. Cap the jar and shake it vigorously. Allow the mixture to rest for a minute or two, then vigorously shake it again. Pour the eggnog into a glass. Garnish it with a sprinkle of cinnamon, nutmeg, and top off with a dollop of whipped topping. Variation: For an adult drink why not add 1 to 2 ounces of Light Rum or Bourbon to each serving. Notes: Finding powdered whole eggs is a bit tricky, but it is available at many large sporting goods stores in their camping supply section or on Amazon. Why do you shake it, and then allow it to rest and share it again? It’s to help the instant whole eggs to bloom in the liquid. I know you get tired of hearing it but always opt for the best and freshest ingredients you can find for all my mixes. 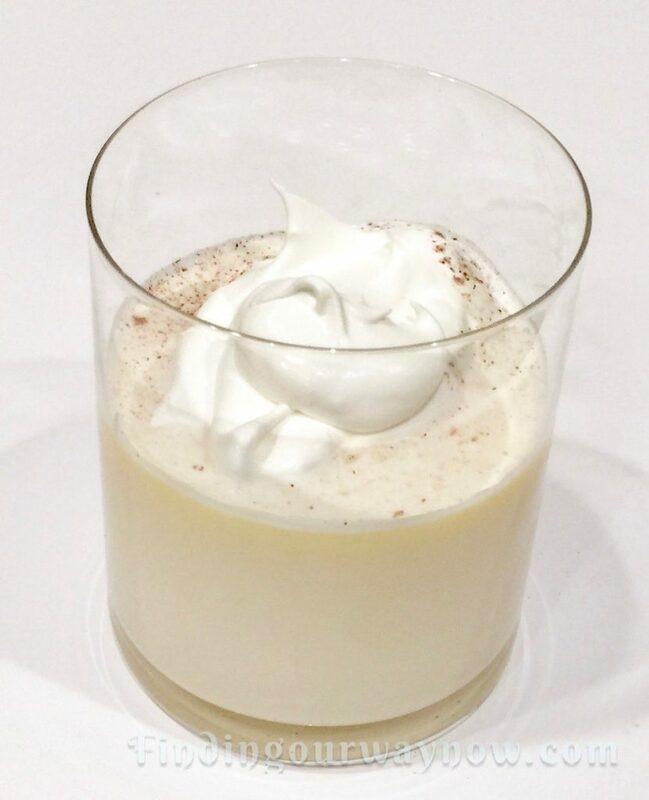 Instant Eggnog Mix is yet another one of my beverage mixes to make and enjoy. 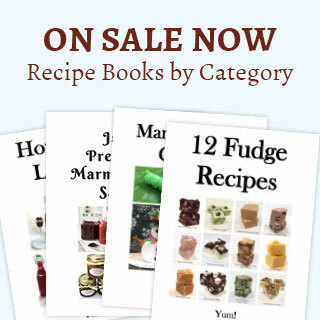 You now have another fun beverage mix recipe to combine with the others to make a fabulous gift basket for any special occasion. 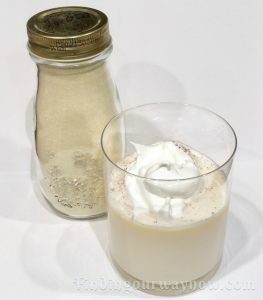 This Instant Eggnog Mix, as well as all my other beverage mixes, are particularly nice to have on hand when the desire strikes for a unique single serving beverage.